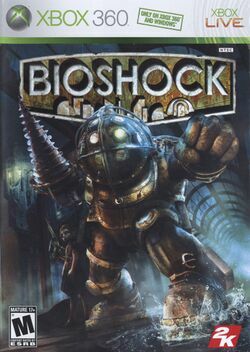 This is the first game in the BioShock series. For other games in the series see the BioShock category. BioShock is a First Person Shooter by 2K Games. It was first released on August 21, 2007 in North America, and three days later in Europe and Australia. Originally marketed as a Windows and Xbox 360 exclusive, 2K Games later announced a PlayStation 3 version, which was released in October 2008. Bioshock is a successor of System Shock 2, developed by the same team. Welcome to Rapture: the city unheard of houses a shooter unlike any before. With a wide range of weapons at your disposal you would think you were well off as it is…But you must also genetically enhance your DNA to turn your body, and more importantly, your fingers into a powerful weapon of destruction. If you are to survive down here, you have got to be prepared for a fight unlike any other. This page has been accessed 23,518 times.